A personal health record (PHR, also known as a personally controlled health record or PCHR) is “an electronic application through which individuals can access, manage and share their health information, and that of others for whom they are authorized, in a private, secure, and confidential environment.”1 PHRs are lifelong summaries of key information from all providers and include data gathered between encounters, and although they may be linked to and share information with electronic health records (EHRs), PHRs are distinct in that the locus of control of information is the patient2 (and in the case of pediatrics, the parent or guardian) instead of a clinician or health care institution. Connecting for Health. The personal health working group final report. Markle Foundation; 2003. Available at: http://www.connectingforhealth.org/resources/final_phwg_report1.pdf. Accessed December 21, 2008. Health Data Management. Draft PHR Standard Model Approved; 2007. Available at: http:// www.healthdatamanagement.com/news/standards_PHR25313-1.html. Accessed December 20, 2008. Walton CG. Written testimony before the Secretary of HHS's Public Advisory Body, the National Committee on Vital Health Statistics and the Subcommittee on Privacy and Confidentiality. January 23, 2007. Available at: http://www.ncvhs.hhs.gov/070123p1a.htm. Accessed December 21, 2008. Centers for Medicare and Medicaid Services. Medicare Testing Personal Health Records to Health Beneficiaries Better Manage Own Health Care. Press release; 2007. Available at: http://www.cms.hhs.gov/apps/media/press/release.asp?Counter=2217. Accessed November 23, 2007. National Committee on Vital and Health Statistics. Personal Health Records and Personal Health Record Systems: A Report and Recommendations from the National Committee on Vital and Health Statistics. U.S. Department of Health and Human Services, Washington, DC; 2006. Available at: http://www.ncvhs.hhs.gov/0602nhiirpt.pdf. Accessed November 23, 2007. Blechman EA. Testimony to American Health Information Community Consumer Empowerment Workgroup Hearing on Personal Health Records; 2006. Available at: http:// www.hhs.gov/healthit/ahic/materials/meeting07/cemp/testimony/3-blechman.doc. Accessed November 23, 2007. Markle Foundation. Connecting for Health. Connecting Americans To Their Health Care: A Common Framework for Networked Personal Health Information; 2006. Available at: http://www.connectingforhealth.org/commonframework/docs/P9_NetworkedPHRs.pdf. Accessed November 23, 2007. 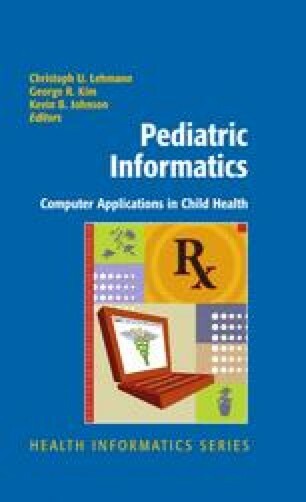 The Children's Hospital Informatics Program. IndivoHealth Boston, MA. Available at: http:// www.indivohealth.org. Accessed December 21, 2008. Microsoft Corporation. HealthVault Redmond, WA; 2008. Available at: http://www. healthvault.com. Accessed December 21, 2008. Health Information Technology Standards Panel. Available at: http://www.hitsp.org. Accessed December 21, 2008. American Academy of Pediatrics. Child Health Record. Commercially available from the AAP Website; 2008. Available at: https://www.nfaap.org/netforum/eweb/dynamicpage. aspx?webcode=aapbks_productdetail&key=e384de72-0f58-4a15-9e21-cf2cebfb52cb. Accessed December 21, 2008. MedicAlert Foundation. Personal Health Record. Commercially available through MedicAlert; 2008. Available at: http://www.medicalert.org/Main/PersonalHealthRecords.aspx. Accessed December 21, 2008. American Academy of Pediatrics. Emergency Preparedness for Children with Special Health Care Needs. Commonly asked questions and answers regarding the American Academy of Pediatrics/American College of Emergency Physicians Emergency Information Form (EIF); 2007. Available at: http://www.aap.org/advocacy/epquesansw.htm. Accessed December 21, 2008. Johnson K. My-Medi-Health: A Vision for a Child-focused Personal Medication Management System. Project HealthDesign. Robert Wood Johnson Foundation; 2007. Available at: http:// www.projecthealthdesign.org/projects/190928. Accessed December 21, 2008. Sandborg C. Living Profiles: Transmedia Personal Health Record Systems for Young Adults. Project HealthDesign, Robert Wood Johnson Foundation; 2007. Available at: http://www. projecthealthdesign.org/projects/191096. Accessed December 21, 2008. Pediatric Health Care at Wellesley-Newton, PC. Practice Website; 2008. Available at: http:// www.pediatrichealthcare.com/. Accessed December 21, 2008. NextGen. Corporate Website; 2008. Available at: http://www.nextgen.com/. Accessed December 21, 2008. CapMed. Capmed Personal Health Record; 2008. Available at: http://www.capmed.com/. Accessed December 21, 2008. Children's Hospitals and Clinics of Minnesota/St. Paul. Children's Medical Organizer; 2008. Available at: http://www.childrensmn.org/cmo/. Accessed December 21, 2008. Dossia. Corporate Website; 2008. Available at: http://www.dossia.org. Accessed December 21, 2008. Dossia. Dossia gains momentum toward providing employees with personal, private, portable and secure health records. Dossia press release; September 17, 2007. Available at: http://www. dossia.org/news-events-media/media-center/doc_download/16-dossia-gains-momentum. Accessed December 21, 2008. Microsoft Corporation. HealthVault; 2008. Available at: http://www.healthvault.com/. Accessed December 21, 2008. Lohr S. Microsoft Rolls Out Personal Health Records. New York Times; October 4, 2007. Available at http://www.NYTimes.com/.Accessed March 20, 2009.